Husky 60 gallon air compressor C602H is the one of the latest 60 gal air compressor by Husky at the moment. It delivers 13.4 SCFM at 40psi and 11.5 SCFM at 90psi. Maximum pressure that it’s able to generate is 155psi. 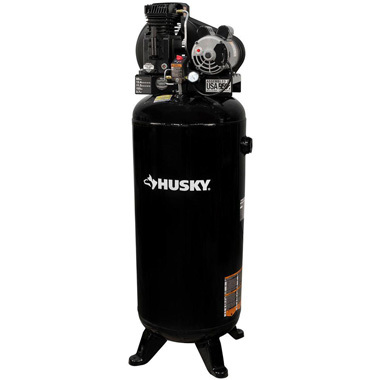 Husky Air Compressor 60 Gallon equipped with powerful 3.7HP motor and heavy cast iron pump. As this pump is oil lubricated you should monitor the oil level and make oil changes as described in the manual. Husky 60 gal air compressor is pretty loud. Its maximum noise level is about 84 dBA, but it does not cause too much inconvenience. In order to reduce the noise of this air compressor, it is recommended to put vibration pads between the compressor and the floor. Note that C602H model does not include a power cord. So you should buy additional power cord for this compressor. If you don’t do a lot painting or do a lot mechanical work you don’t need such big air tank. For home use you should look for a smaller models. This air compressor is best fit for garage, auto repair shop and even for small industrial shops where constant access to compressed air is required. Transportation. Check your vehicle’s manual to determine if the tailgate can support the weight of the unit. Unloading. Move the compressor to the edge at the tailgate. One person should remain in the truck bed lift the unit out of the truck, two or more people should lift the unit by the skid and one person should maintain unit balance from the truck. Since unit is top-heavy, move the unit to the installation location. Use mechanical aids such as a pallet jack or slide the unit on a skid to the specific location. Unload the unit from the shipping skid. Note, it should be located at least 18 inches from any wall or surface. Before first start check oil level. Some models are shipped with oil in the pump. If oil is needed refer to the specification label on the compressor pump for proper oil capacity. Delivers 11.5 SCFM at 90psi, 13.4 SCFM at 40psi. Tips: When you drill a hole in the floor, throw mounting bolt in it before removing the dust. This bolt will prevent to get back the dust into the drilled hole.